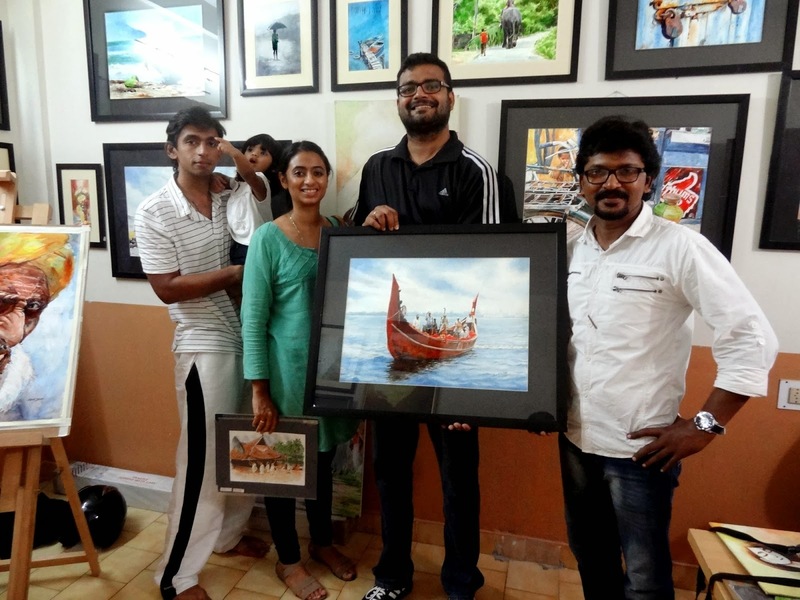 JACOB JOSEPH PUTHENPARAMBIL: Invest in art, maybe? Those who know me know that I am not the first person on their speed dial when it comes to talking about art, fashion and also... F1 (there I said it!). But once in a while, I do come across a painting that kind of calls out to me. I develop a sudden urge to own it. It's not about who is the artist but it strikes a cord somewhere inside my messed up brain. The first ever experience was almost five years, at an art exhibition in Delhi at the Travancore House organised by +Shree Sreenivasan's aunt. I was strolling along totally disinterested and then it hit me, BANG! There was a painting, which looked like a drawing of a group of women going to Church in the Kerala countryside. The group was led by an elderly woman and the Church looked liked one I knew. I kept starring at it for a while absorbing as much of its detail as I could. Some how looking at it gave me a warm feeling (no, I am not the mushy type), something to do with my childhood and time spent with my grandparents. I asked +Shree if it was on sale and if I could buy it? He checked with his aunt. It was by an artist named Namboodiri (never heard of him before) and the going price was INR30,000. I thought I better check with my wife, it is above my 'cost-of-five-beers-at-a-fancy-place' auto approval spending threshold. Unfortunately trying to get my wife to spend or invest money over the phone is a lost cause. Even before I could get back to +Shree, I was told the painting is already sold. After a few years, I educated myself about who Namboodiri (spelled Namboothiri by some) is and came got exposed to more of his work. This article by +Keerthik Sasidharan for +Caravan Magazine is a good read. I never found out who bought that painting or where it is now. Google Image Search has not be very helpful in finding a digital print of it. If anyone reading this has a clue, please drop me a line. Three years later in Kochi, I found myself dragging my family through the Kochi Muziris Biennnale. We were not there as art lovers but to make a statement. The event has attracted a lot of, the usual, anti globalisation-western culture- multinational protestors. I didn't was such a prestigious event to be lost to "controversy" like so many other projects. I thought he best way to show support for the event and its organisers was to go there, buy tickets and, if time permits... take look at the exhibits. Then it happened again. BANG! I saw this. Subodh Gupta's "What does the vessel contain, that the river does not." All of a sudden it talked to me. My wife and I are what you call third culture kids and this...wait... what is that? Is it a sculpture? It said so many things, how many times we moved with our parent's changing jobs, what we leave behind, what we carry with us. All good but is this something you buy and take with you home? How is this art? I would like to carry this feeling with me but where do I keep it? Maybe I should make something like this. In June 2013, it was reported that the above, "Installation", was sold for $800,000. Once again, it captured my attention. No idea why but my guess is that it has to do with people travelling for opportunity. 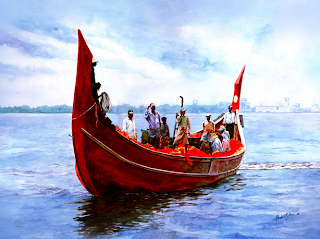 I contacted the painter, +Abdul Salim Kochi, and asked him if I can have it. He said yes. Turns out is he a well known award winning artist. This is a painting he did in 2006. I decided to write about him on +The Kochi Post (link). When I visited Kerala in July, the day I was leaving for Singapore, I picked up the painting with the family at his studio. +Abdul also is a wonderful human being. Not only did he gift prints and smaller paintings to the family, he also made it a point to personally deliver my bag (containing passport, tickets and my mac) after I left it at this studio while getting this picture taken. I have no idea how much this painting is worth but it makes me happy. I am glad +The Kochi Post and this blog uses it has the main image. 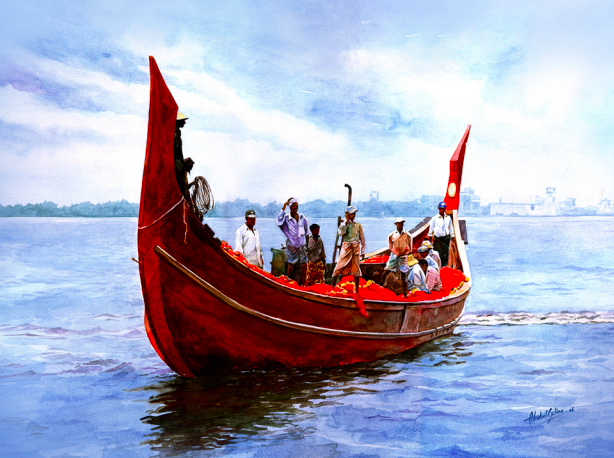 If you are looking for works for +Abdul Salim Kochi, you can buy it here, as low as $299 (inclusive of shipping). Have a look, maybe something will strike a cord.